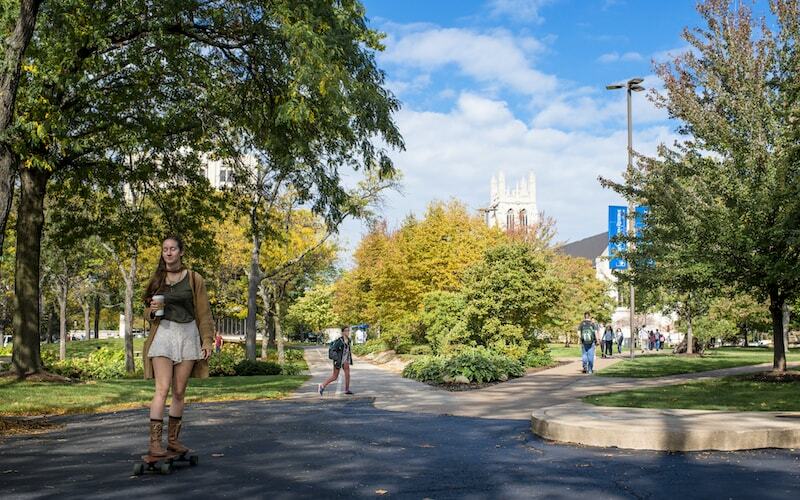 Think of Case Western Reserve University as an idea that hits you from all directions – all of them good. Then those ideas grow to change the world in some way. The world-renowned center of learning, research, and innovation is to Ohio what a spine is to the human body. Particularly in Cleveland and Northeast Ohio, but CWRU’s impact is felt worldwide. It feeds our knowledge of the latest trends and practices in innovation and technology, while educating thousands of future lawyers, executives, and innovation and tech specialists, and providing research used worldwide. In order to dive into CWRU’s many facets, we created a virtual roundtable with five administrators: Bob Sopko, director of CWRU LaunchNet; Sue Rivera, vice president for research and technology management; Grant Goodrich, director of the Great Lakes Energy Institute; Nick Barendt, executive director of the Institute for Smart, Secure and Connected Systems (ISSACS); and Drew Poppleton, interim director, Post-Graduate Planning & Experiential Education. Innovation & Tech Today: What are the differences in the needs and career focuses of undergrad and grad students now versus 10 years ago? Bob Sopko: The rapid change of technology, world-market competition, and collaboration demands our students, companies, and organizations be well-versed across a spectrum of ever-changing equipment and ways to work together. Having a 50,000-square-foot innovation space contributes to that collaboration. I&T Today: In what ways are you working with your 270+ new industry partners on priorities for today? For instance, blockchain? BS: Speaking to blockchain, there is a large initiative that brought in world leaders to Cleveland for this growing technology, Blockland Cleveland. At CWRU, we seek to understand how to put blockchain into practice to enhance areas we are already focused on, including the Internet of Things, big data, artificial intelligence, and medical innovation. I&T Today: Let’s dive into a few programs for a minute. How are you advancing sustainability and alternative energy education? Grant Goodrich: There are a few ways in which we actively work with companies. First, companies can directly fund the research or educational opportunity they need here on campus. Siemens Corp. recently established a Digital Grid Laboratory and curriculum, through which CWRU will train future electrical, controls, and systems engineers using Siemens software to operate the digital electrical grid of the future. A second way is through collaborative government-funded research. Two energy researchers at CWRU have planning grants from the National Science Foundation to develop Industry-University Collaborative Research Centers, one in industrial energy efficiency, the other in energy-materials data analytics. We work with small companies and entrepreneurs through the Small Business Innovation Research (SBIR) program, through which many federal agencies can support research for small businesses that need assistance to grow their products and companies. Finally, we aggressively work to stay on the forefront of developments in the energy field. Our Great Lakes Energy Institute works to synthesize that information and share it with our faculty and university leaders to help inform direction and areas of future research and scholarship. I&T Today: Tell us about ISAACS. Nick Barendt: The Institute for Smart, Secure and Connected Systems (ISSACS) is focused on fostering collaborations on the Internet of Things (IoT) across the university and with our partners in industry, nonprofit groups, and economic development organizations. IoT is really the convergence of devices, communications, and data and analytics – the digital convergence. Clearly, technology alone is insufficient to address society’s most complicated problems, so we are taking a “Tech-Plus” strategy. ISSACS is fostering convergent, collaborative research, translation and education in health, manufacturing and infrastructure/smart cities. ISSACS is part of the IoT Collaborative (IOTC), with Cleveland State University. The IOTC is working with our local economic development partners to align regional efforts in connected devices. I&T Today: Then there is the Sears think[box], which has received good coverage recently. How is it feeding the tech and innovation needs of Ohio? BS: Cleveland, as a community, has the advantage of going through adversity and learning how to work together. We continue to help each other. The State of Ohio provided Sears think[box] $1 million toward the $35-million, 50,000-square-foot innovation center because we already were accessible to the public. Everyone is welcome to use the space, and there is no charge. We encourage local high schools, community colleges, and universities to bring their students for a tour and to use our facility. Ten percent of the visitors to Sears think[box] are from the outside community; 15 percent are from our neighbor, the Cleveland Institute of Art; 40 percent are engineering students and the balance are from different disciplines at Case Western Reserve University. I&T Today: Today, students and young workers can create a business and run it from their devices. How do you weave together old and new models to make sure they combine 21st century practices with solid business core values and foundations? BS: In addition to supplying the physical tools, we provide a location to encourage the accidental collision and growth of ideas. Having inventors hang out with artists, English and Nursing majors – along with business mentors, investors, students, and community members – amounts to a diverse mix of encouraged chaos, which, over time, has the ability to produce amazing results. We want people to play, invent, and have fun. If a business comes out of it, we can assist guiding through market validation, providing a no-charge intellectual property venture clinic and access to competitions, capital, strategic partners, and mentors. I&T Today: From where you sit, where are the next areas of innovation to be researched? And brought online both academically and economically? Sue Rivera: We are very focused right now on looking at digital innovation of all types: blockchain, Internet of Things, AI, quantum computing, augmented reality, etc. We think CWRU – and Cleveland – can lead in these areas. We have what it takes to use technology to solve important problems and benefit society. Our efforts in these areas will not only develop the next generation of thinkers, they will fuel the region’s economic engine. I&T Today: How has the focus on STEM and STEAM impacted the way you educate and help grad students locate ideal career or entrepreneurial opportunities? Drew Poppleton: This is a fitting final question because the initiatives and investments in innovation mentioned throughout this roundtable reflect CWRU’s approach to educating and preparing our students for the future. Not one is focused on building technical expertise alone, as important as that is; rather, each also emphasizes some element of collaboration, interdisciplinarity, leadership, and impact, if not all. The greatest opportunities for advancement and change – whether in our own community, industry, or the world at large – demand people with diverse skillsets and mindsets working together in pursuit of a common goal. That’s why think[box] is open to the public; why ISSACS isn’t housed in a single department; why our new data science major is heavily connected to industry; why LaunchNet’s Venture teams routinely combine students from several different majors; and why every CWRU student completes a senior capstone project. In the end, all of this intentional cross-fertilization benefits students in significant ways. As a result, our students are highly sought after by employers for leadership development programs, elite consulting teams, and other opportunities where they start out higher than the individual contributor role so typical of entry-level positions.